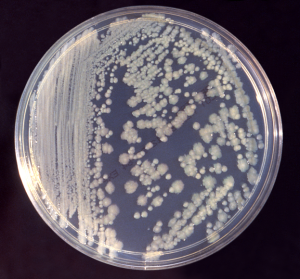 This assay is designed to amplify the single copy bacterial gene rpoB. does not amplify DNA from archaea. This assay uses a number of degenerate primers designed against a conserved region of the gene to amplify bacterial rpoB. It has been tested in several individual bacterial cultures including Staphylococcus albus, Micrococcus luteus, Escherichia coli, Bacillus subtilis, Bacillus megaterium and Bacillus mycoides, as well as in mixed baterial populations such as oral biofilms and environmental samples. When used in a mixed sample, amplicons generated may differ in sequence but not in product size. This does not affect the accuracy of quantification. 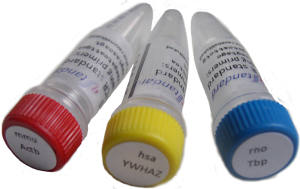 The stock assay, 2_rpoB_G01, contains a standard derived from several species for use when quantifying samples of unknown bacterial composition, but standards for individual species can be provided if preferred, please email info@qstandard.co.uk.